Rather than relying on In-Circuit-Emulators, to support development, most modern embedded microprocessor chips include programming and debugging capabilities built into the chip itself called variously On-Chip-Debug, BDM (background debug mode)/JTAG/SWD/SDI. PEmicro pioneered some of these techniques and their products are included in many NXP/Freescale EVB packages. These tools are now available to work with a number of popular Microprocessor families. We can supply P & E's extensive range of tools from stock, including interfaces, flash programming software, in-circuit debuggers and assembler/editors. These products are full 32/64 bit windows apps that will run on all current Windows OS. PEmicros product range covers a wide spectrum of requirements so we hope that the table below will help you to choose the best one for both your current and long term needs. If you are still having problems please email us with details of your application. We recommend the Cyclones for high volumes such as production programming. † ARM Cortex M4 currently supports the following families: ATMEL SAMxxx, STM32, NXP M0,M3,M4, NXP/Freescale Kinetis (all), S32, TI-Stellaris LM3S,LM4,TM4C12xx, Infineon XMC4xxx, Maxim 716xx, Silicon Labs EFM32,SiM3, Cypress PSoC®4, Toshiba TX00,TX03,TX04 as well as a wide range of on and off chip SPI and off chip flash memories. email us with details of the chip you need information on. Why Pay extra for the FX version ?........the most important reason is that for those chips marked with a star the download speed is 3 - 5 times faster. Cyclone for STMicro will program the internal flash and where available external flash for STM32, STM 8 and SPC56 families. Cyclone for Renesas and Hitachi will program the internal flash and where available external flash for R8C, M16C, M16C/80, M32C, H8 and H8S/Tiny families. These ARM based CPUs all have On-Chip-Debugging and PEmicro produce a range of USB interfaces between the PC and the chip with supporting software which can be used for Flash Programming or program debugging. It has a JTAG interface and PEmicro provide a USB PC interface to it along with software that includes a Flash Programmer a complete debugger and GCC compiler with examples ready to run "out of the CD box" The Cyclone Max provides both PC based development as well as PC and standalone production programming capabilities. Like the HC12 these CPUs have a BDM interface that provides a simple debugging mechanism. PEmicro produce USB and Ethernet interfaces between the PC and this BDM. Software is available to support those interfaces for Flash programming, debugging and production testing. All 68HC08s have, built into the chip, a small software monitor (MON08) which links to the outside world via designated pins and which can be used by developers to test programs and to program chips that contain Flash or EEPROM. 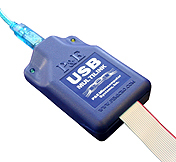 PEmicro provides USB interfaces to this non standard serial protocol and a free set of development software. These CPUs such as the 68332 all have a special interface included on the CPU called BDM that provides a simple debugging mechanism. PEmicro produces interfaces between the PC and this BDM. Software is available to support that interface for Flash programming, debugging and production testing.